J.A.D.S. Farm Market is proud to offer it’s 2nd season in our NJ location and our 10th season overall of our Farm Market Style CSA! Do you want original hanging baskets, healthy vegetable plants just like your farmers for your home, local milk and meat, the juiciest fruits of the season, fresh healthy vegetables from a local black dirt farm, all the colors and flavors of fall, wrapping it up with beautiful handcrafted Holiday items and the best Homemade Holiday dinner fixers? 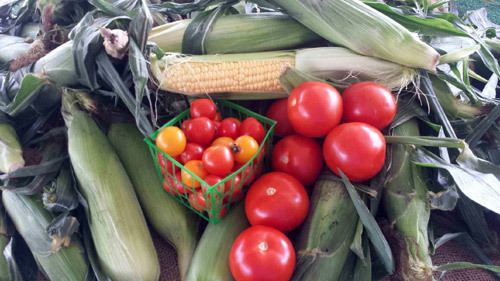 Sweet White CORN and Beefsteak TOMATOES are always included along with many other favorites. Check out the details on our JADS Farm Market 2019 CSA Program – 2019 CSA REGISTRATION FORM. 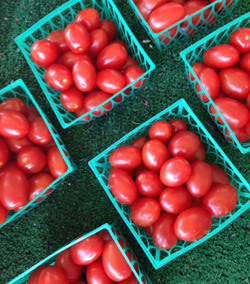 Yep, we’re moving our Farmers Market! We’re sad to moving from our hometown of Pine Island NY, but the move was necessary. 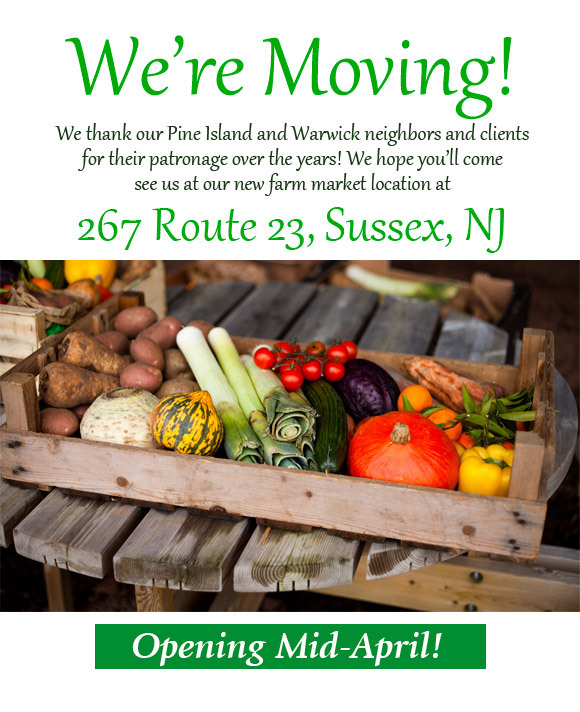 Our new JADS Farm Market location beginning early April 2017 will be 267 Route 23 in beautiful Sussex, New Jersey – just a few miles down the road. We hope you’ll come visit us! We are proud to supply our own farm grown vegetables wholesale to local chefs & restaurants. We send out a weekly wholesale list to restaurants and we now can arrange delivery! The produce list includes the vegetables and farm produce we’re picking fresh off the field that week – along with quantities and prices, sent each week – to help you provide your clientele the freshest, local produce grown right here on our nutrient-rich Pine Island NY Black Dirt Farm! The fresher the produce the healthier it is for us, and the better it tastes. The shorter the time between the farm and your dinner plate, the less likely it is that nutrients and flavor will be lost from food – especially vegetables. The reasons are numerous but keeping your local family-owned farmer in business seems near the top of the list for us! You can arrange a convenient time to pick up directly from our farm or we can provide delivery. Subscribe to our John D. Madura Farm Wholesale Vegetables email here! Be sure to select the “Please send me Wholesale Info” button! You can also contact us for further details – or download a PDF of our current wholesale vegetable list on our wholesale produce page. 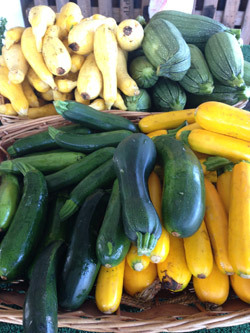 Wholesale Produce – Add Local & Freshly Picked Vegetables and Produce to your Menu Offerings! 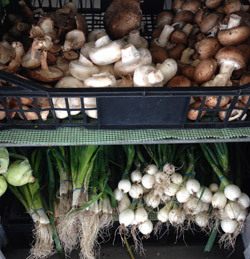 We provide local wholesale produce in bulk to local chefs & restaurants! This year we’ve begun sending out a weekly wholesale produce list to local restaurateurs and interested individuals! The produce list includes the vegetables and farm produce we’re picking fresh off the field that week – along with quantities and prices, sent each week – to help you provide your clientele the freshest, local produce grown right here on our nutrient-rich Pine Island NY Black Dirt Farm! Why buy local? The reasons are numerous but keeping your local family-owned farmer in business seems near the top of the list for us! 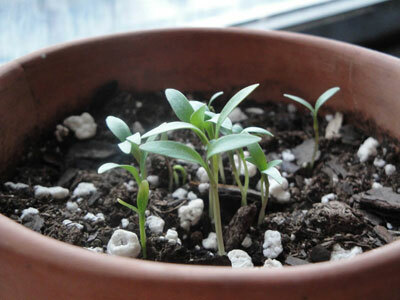 We think GrowNYC.org has a great list of additional reasons – click here to read more reasons to buy local produce. 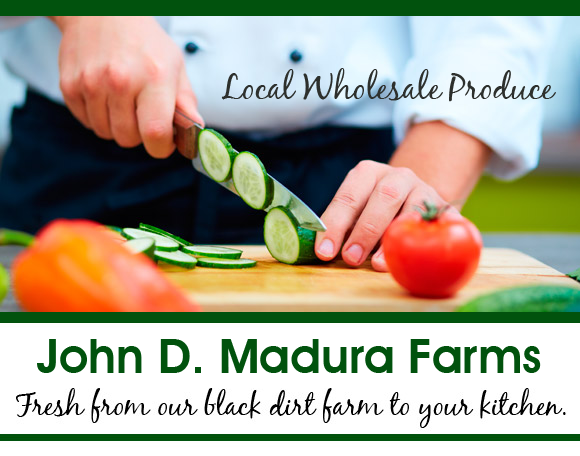 Subscribe to our John D. Madura Farm Wholesale Produce email here! Be sure to select the “Please send me Wholesale Info” button! You can also contact us for further details – or download a PDF of our current wholesale produce list on our wholesale produce page. 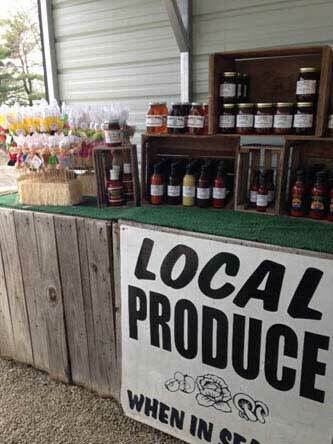 Therefore, we’re always on the lookout to add delicious new local products to our farm stand! We’re excited to announce that we now have a freezer full of local, natural cuts of meat and poultry…from steaks, bacon, and fryers to local kielbasa. We’d love for you to stop in and take a look! We also have carry a variety of baked goods, cookies, pies, breads – and several flavors of the super-popular granola from Bread Alone! Of course, we always have our own freshly picked produce grown right on our Pine Island black dirt farm, John D. Madura Farms, located just up the road from JADS Farm Market. We also carry our own popcorn, natural eggs, local cheeses and fresh milk from nearby Westtown NY’s – Back to the Future Farm. As for August – we’re piled high with freshly picked sweet corn, plump tomatoes, garlic, onions, potatoes, zucchini, string beans, peaches and more!! Don’t be a stranger! Stop in and say hello!! The weather is cold and gloomy out there…but we are here making sure you have everything you need to get your home or business “spruced” up for the holidays! We have wreaths, pine roping, Christmas trees, small potted trees and assorted holiday decorations. Plus, as usual – we have canned goods, like jams, jellies, honey, syrups… that make great gifts – especially in a basket! We also have plenty of winter vegetables for stews and casseroles and for your favorite holiday dishes! 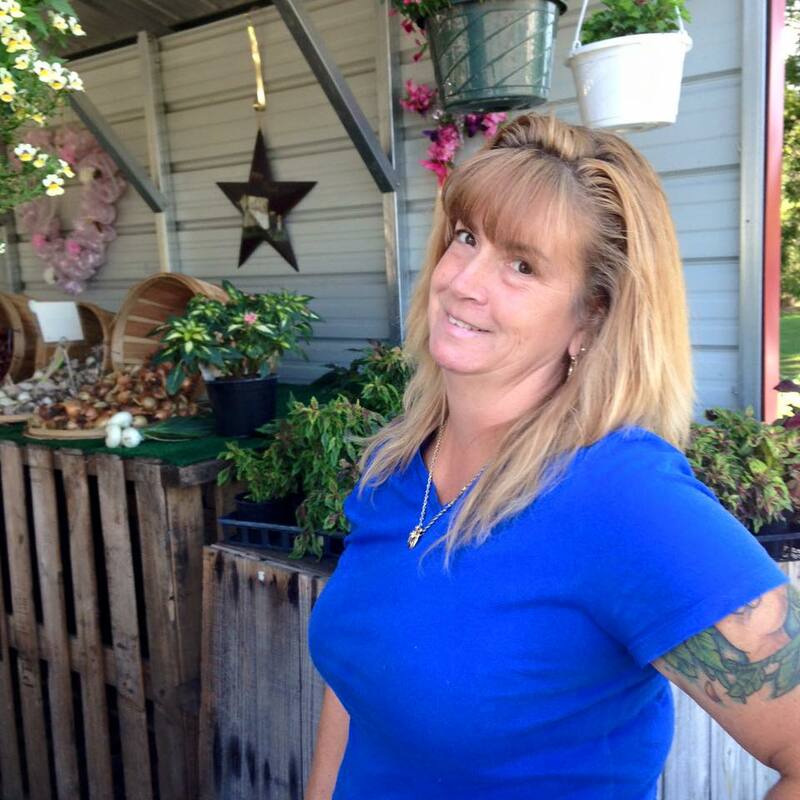 We love our customers and are proud to provide our own-grown produce in our beautiful hamlet of Pine Island! Thank you for shopping locally! We are looking out at the first snow of the season! We have a new litter of piglets to keep warm and much harvesting to do on the farm! We’re cleaning up the last of early fall items at JADS Farm Market and getting ready for…you guessed it! 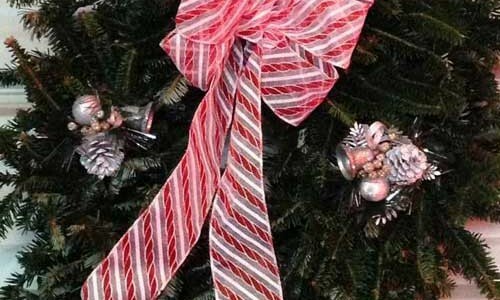 Christmas trees, wreaths, roping and holiday items! We are growing our own hyacinths, lillies and other early spring plants and herb seedlings to have ready for sale at JADS Farm Market for our Spring Opening in April!